Left-wing bent of Kahlon's new party increasingly apparent; ex-police chief who also approached Kadima en-route to join party. 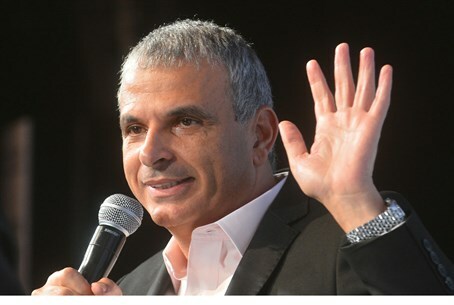 There has been much speculation surrounding former Likud Minister Moshe Kahlon's new as-yet-unnamed party, but the indications that it will be a decidedly leftist party strengthened with reports Tuesday indicating the head of the party's election headquarters in the north is a former member of the Kadima party, which favors massive "unilateral" territorial concessions to the Palestinian Authority. According to Channel 2, Haifa Mayor Yona Yahav will take up the post. While Yahav refused to respond to the reports, those around him told the paper on Tuesday that it was clear he would support "a candidate from Haifa." Kahlon himself was born in nearby Hadera, with the reference clearly being to him. Yahav's placement is important in indicating the new party's ideological bent. Kadima was founded by former Prime Minister Ariel Sharon when he broke off from Likud to push through the 2005 Disengagement plan, which saw thousands of Jews expelled from Gaza and northern Samaria. It is still unclear whether Yahav intends to contend on Kahlon's Knesset list, or just take control of his election campaign in the north. The party is anticipated to gain somewhere between nine and ten seats according to recent polls. Kahlon himself gave an indication as to the political leanings of his party last Friday, when he said "we will not waste an opportunity for peace and will not hesitate to vacate territory," leaving open the option to expel Jews and concede land. On Sunday ex-Likud MK Carmel Shama-Hacohen, a friend and former ally of Kahlon, said the statement really indicated a shift to the left, saying "he said it clearly, he did not use doubletalk. ...People are allowed to change their opinion and fit it to the changing reality." As a member of Likud, Kahlon was viewed as being nationalist and was a close ally of MK Moshe Feiglin. In April of 2011 he responded to threats of unilateral declaration of Palestinian statehood by saying that if the threat materializes, Israel should announce annexation of all of "the territories" that same day, and that Palestinian Authority (PA) funding should also be stopped. More Kadima in Kahlon's party? Kahlon has left many points about his new party still in the dark, although on Sunday it was reported that former police commissioner Moshe Karadi - who resigned amid scandals - is discussing with Kahlon about the possibility of joining the party. Karadi and Kahlon were together at a meeting of party activists in the northern moshav of Dalton, near Tzfat (Safed). There, Karadi said "there are contacts (on joining the party), but nothing is finalized." Significantly, Karadi also said that in the last elections he was in touch with Kadima about joining them, but in the end decided not to run. Explaining that his presence at the meeting had deeper implications, Karadi said "I wouldn't have driven here for nothing, just to talk and clear the stage." Much of Kahlon's anonymity to this point apparently is intentional to leave room for leverage. While his party has signed a ballot surplus agreement with outgoing minister Avigdor Liberman's Yisrael Beytenu, Kahlon has said he would be open to joining a coalition headed by Binyamin Netanyahu. "I will join whoever will implement my agenda," said Kahlon. "I didn't prepare plans for two years just to sit on the side and not do anything, therefore it's a mistake to rule things out in advance."